Model of the airport terminals including the new additions. 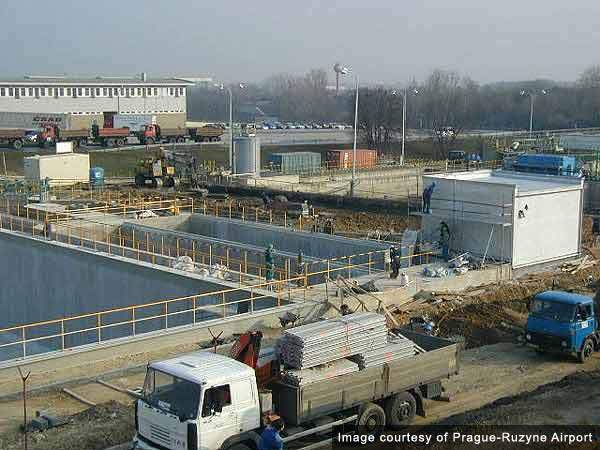 Construction of the water purification facility. 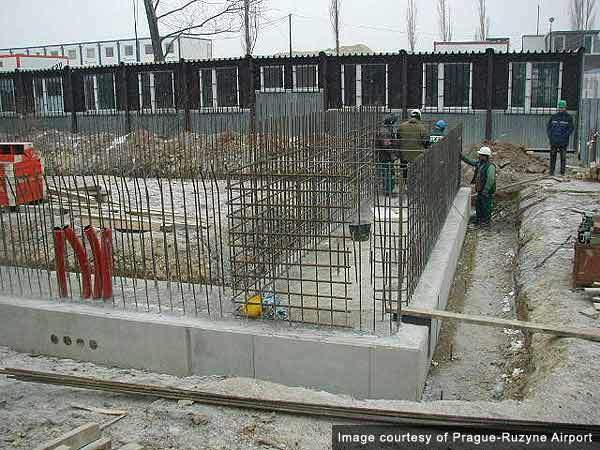 Construction of the connecting building. The Pier C arrival and departure gate area (three levels) is located northwest of the new terminal. A two-storey building, accommodating new technology and a large retail area, connects the old and new terminals. The Terminal North Two building. The site of the Terminal North Two building. 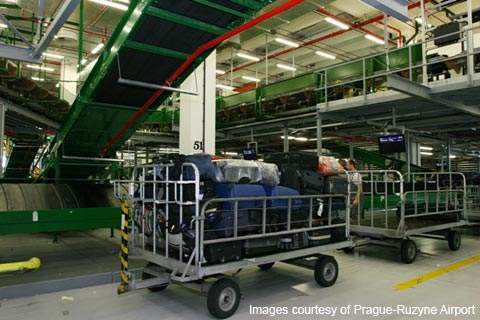 The baggage-handling system at Prague-Ruzyne Airport. Prague-Ruzyne main airport departure concourse with flight information display. One of the new boarding bridges in terminal north two. 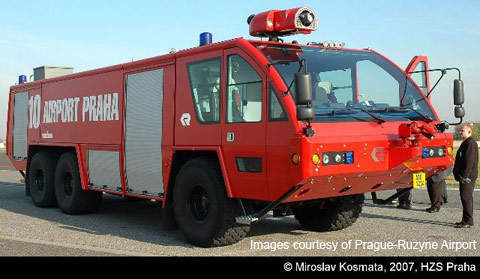 Prague-Ruzyne airport has new fire stations and new fire rescue vehicles. Prague-Ruzyne Airport multi-storey car park. 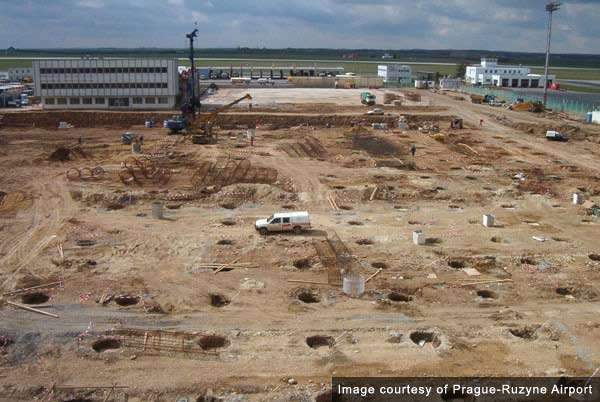 The EUropa project expansion plan at Prague-Ruzyne Airport in the Czech Republic was completed in late 2005 and the facilities were fully operational by February 2006. 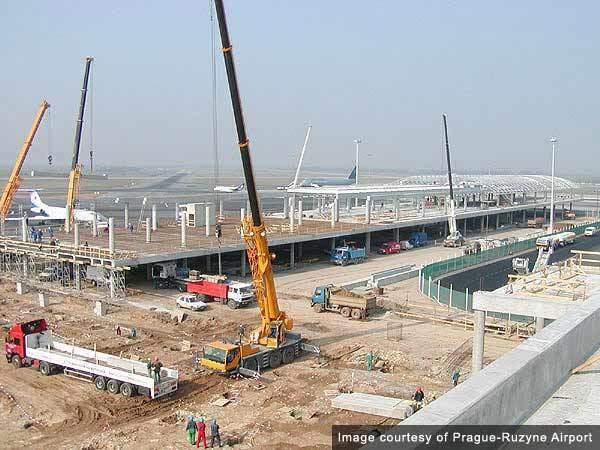 The project involved several major construction projects including the construction of a new North Terminal building and associated infrastructure, the construction of a new parallel runway and a general expansion and upgrade of some of the other airport facilities. 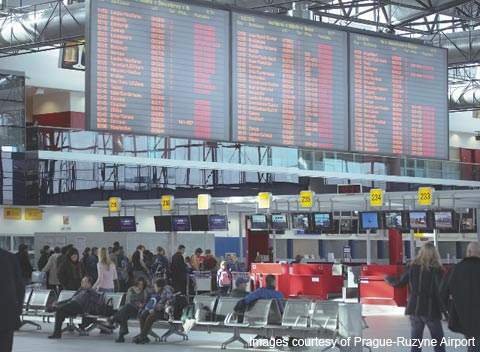 The airport has seen a large increase in the numbers of passengers it handles due to the entry of the Czech Republic into the EU. Popular destinations include Paris, Frankfurt, London, Amsterdam and Moscow with the most popular long-haul destination being New York. The airport played host to over 12 million passengers in 2007 and this is expected to increase again in 2008 (increase of 7.3% over the 2006 figures). The airport is one of the largest in Central Europe and was upgraded to become established as the most important air transport hub in the area. 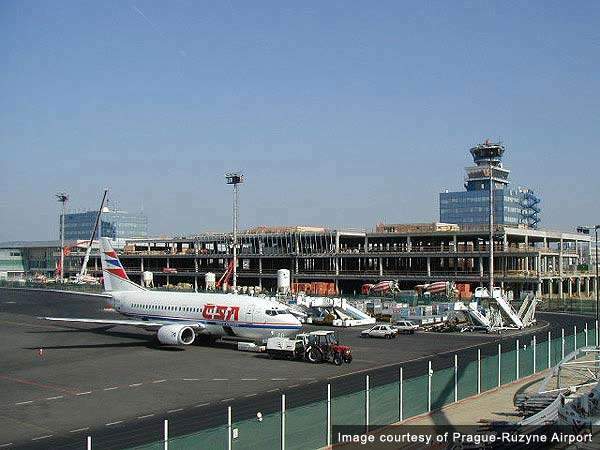 In 2007 Prague Airport was voted the best airport in Central and Eastern Europe in the Global Travellers opinion poll of World Airport Awards. The new pier B facilities (opened in 2003) and the new Terminal North Two (stage 1) allows the airport to handle 10 million passengers per year. Plans are currently (mid-2006) being considered for a stage 2 expansion of Terminal North Two to accommodate up to 17 million passengers a year (it is likely this will be built given the 2007 passenger figures). Terminal North Two has adopted the Schengen visa arrangements for European countries (this was fully implemented by January 2007) while the old terminal has remained as domestic non-Schengen space. The Czech Republic entered the Schengen Treaty in mid-2005. Stage 1 of Terminal North Two was started in June 2003 and was completed in late 2005 (pier C and the first floor of the connecting building were opened in September 2005). 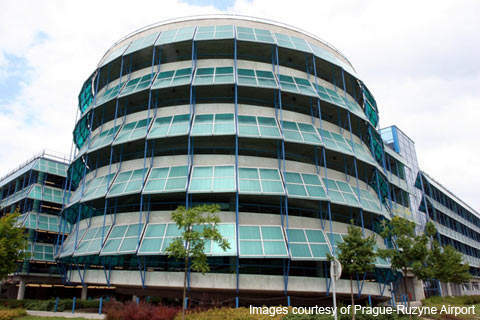 The total investment for this was €330m, of which €300m was met by the European Investment Bank, guaranteed by a consortium of Czech Republic financial institutions. The remainder of the investment was met by European subsidies and government money. 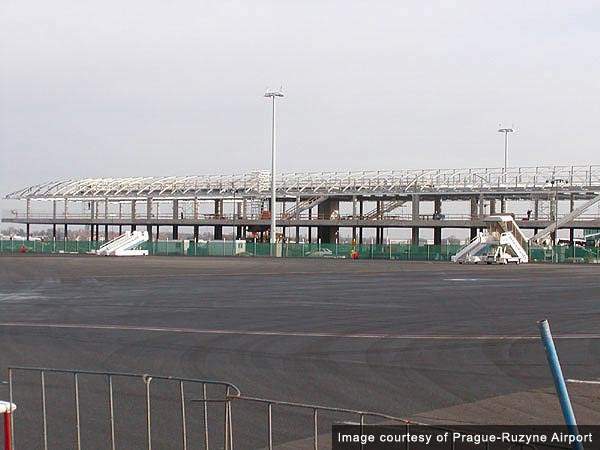 The project was carried out for the Czech Airports Authority (Ceská správa letišt’ Praha, s.p). The EUropa Terminal North Two project (stage 1) was divided into four phases. The first was the Terminal North Two main building, which is a three-storey construction including a passenger hall accessible by a perpendicular overpass with separate arrival and departure levels and a subterranean level for a luggage distribution centre. The second phase involved the merging of the new and old terminals through the construction of a two-storey connecting building to accommodate the terminals’ new technology and a large retail area. "The total investment for the project was €330m." The third phase of the EUropa project involved the construction of the pier C arrival and departure gate area (three levels), which is located northwest of the new terminal. It is able to accommodate 14 aircraft and the number of boarding bridges has been increased from 17 to 27. The fourth phase was the expansion of infrastructure to provide new access roads, car parking areas and new aircraft aprons. The traffic in Terminal North Two is on two levels; the arrivals area is at ground level with departures one level higher (approximately 6m higher on an elevated road). The new parallel runway, RWY 06R/24L, is a separate project in response to the anticipated increase in air traffic at the airport over the next ten years. The runway will be constructed 1,525m from the existing runway, RWY 06/24, and parallel to it (expected to open in 2009). Its dimensions will be 3,550m by 60m. The investment for the runway is estimated at 1.8m and construction began in late 2007. The new facilities in Terminal North Two give 53,195m² of new floor space. This is now used to establish separate areas for EU departing / arriving passengers from other international flights. There are new conference facilities, increased space for business class and VIP lounges and special facilities for passengers with children and disabled passengers, as well as a pharmacy. There has been a large increase in the number of retail units and restaurant areas, both in public and transit lounges. Service space for airline companies and airport staff has also increased. The luggage handling system is able to handle 3,000 pieces an hour with the potential of increasing to 5,000 pieces an hour. The number of check-in counters has increased to 60 and will eventually reach a total of 100. "The new facilities in Terminal North Two give 53,195m² of new floor space." Terminal North Two was built using the combined method. The lower floors were designed as ferroconcrete structure while the upper part (roof) is made of steel. The ferroconcrete structure was fixed on modules 15m x 12m, being divided into several dilatation units. The structure itself is made up of a bidirectional frame with a ferroconcrete slab fitted with reinforced supports. The support span is 57m, the spatial structure being constructed of tubes. The connecting facility construction is also made up of ferroconcrete structures at all three levels. 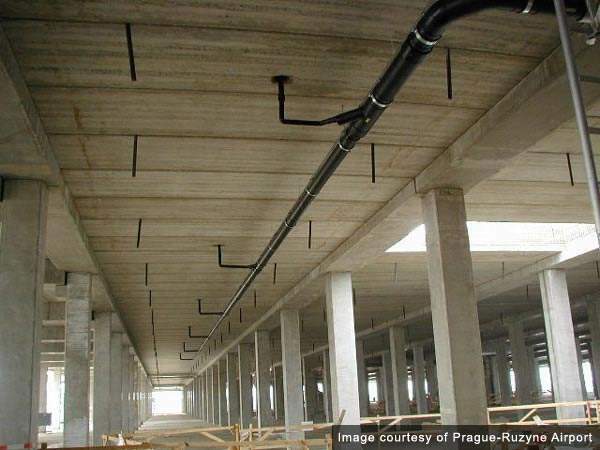 The long connecting corridor roofing is also made up of steel structure with partitioned truss frames supporting the roof surface. Façade surfaces were designed and installed as a combination of iron-plate panels with glass walls. 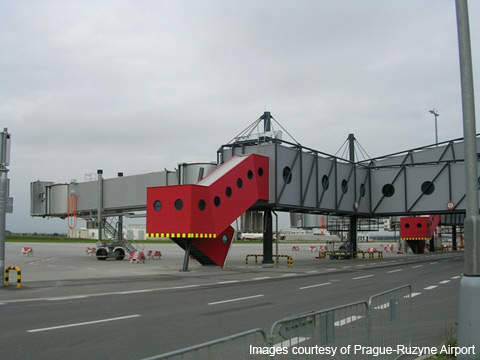 Prague Airport has developed three important facilities for its Fire Rescue Service. Branch Station North was completed in late 2005; Central Station North was completed by June 2006 (construction was started in June 2005). The construction of Branch Station South is almost complete and will be open to coincide with the opening of the new runway in 2010. The new facilities aim to reduce the future deployment time to any incident airport-wide from three to two minutes. Central Station North will function as the hub installation. 1,343m² of Wi-Fi internet access was launched at the airport on 5 October 2005. The access is provided by T-Mobile and is available in the first floor self-service restaurant of Terminal North One along with the viewing terrace. The connection conforms to the IEEE (Institute of Electrical and Electronics Engineers) 802.11a, b and g standard with a maximum connection speed of 11Mbps. Installation has continued into the new Terminal North Two. The architect for Terminal North Two was Nikodem and Partner. The project management and civil engineering was carried out by Bovis Lend Lease. The contractors for the construction of the various parts of the project include Skanska and Strabag. Metrostav built the connecting buildings from the new terminal to the old terminal and the main substation collector in Terminal North Two. "The airport has 1,343m² of WiFi internet access." The roads and some ancillary buildings were constructed by a consortium of Doprastav and Metrostav. 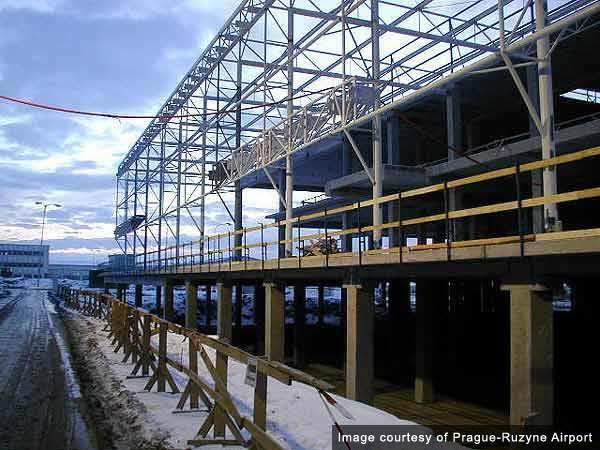 Pier C and associated buildings were constructed by Hochtief VSB and ZS Brno. The luggage sorting area equipment contract was awarded to VanDerLande in February 2004. The contract for interior equipment was awarded to Techo. The contract for communications and information technology infrastructure was awarded in November 2004 to Kapsch Telecom, KonekTel, AEL Communications CR, WaveCom, T-Systems Pragonet, Copet, Macsource, LGelectronics CZ and Kovotrade Group. 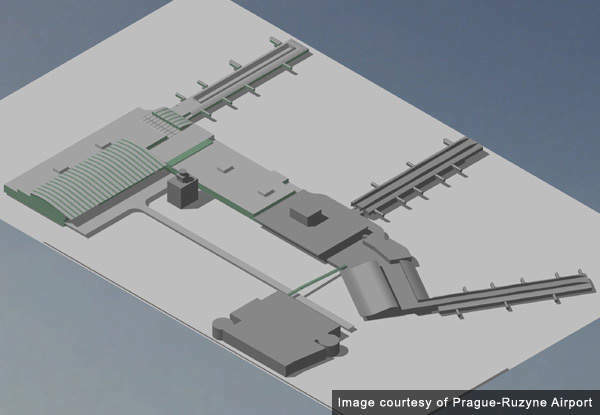 In November 2007 Prague began the testing of a new prototype system to detect combustibles, acids and explosives in liquids contained in passengers hand baggage. The system, which is called EMILI 1, was invested by a German inventor called Dr Norbert Klein and will be able to instantly ascertain the safety of the contents of liquid bottles to be taken onto aircraft. The system works on the principle of very weak microwaves (much weaker than those emitted from a mobile phone) being used to scan the container. The principle will work on water, yoghurt, baby milk, shower gel and shampoo. The system has been supplied for testing by the security company Emisens. The device only weighs 17kg and has a footprint of 300mm × 480mm. Si ATM provides products and services for air traffic management. It has 30 years of experience of installing operational systems and simulators to air navigation service providers, training institutes and other aviation organisations throughout the world.